In adition to this, from the VA's MakeTheConnection.net site, there are more federal, state, local government and community resources. Check the boxes next to all the topics you want help with, on our Landing Page. Put you zip code in the box at the bottom, press "search" and you'll find local help for you AND your family. It's your turn to get your best life back! As a family member, friend or significant other, YOU too may be suffering from your own issues. 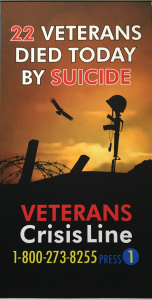 THERE IS HELP FOR YOU, AND YOUR FAMILY AND YOUR VETERAN. There are lots of people just like you, going through these difficult times of life. Getting together with a counselor and/or a group of other vet care givers, is both comforting and really helpful. The advice of what has worked for others and what has had unintended consequences can be invaluable. All donations are made to support our general mission and are Tax Deductible under IRS rules.